Just because it’s raining, doesn’t mean you can’t still have fun outside. Don’t let a little rain stop you. All you need to do is think a little differently and you can still enjoy the great outdoors, even if it is a bit wet. We can thank Peppa Pig for this one, but most kids will be familiar with jumping up and down in muddy puddles. 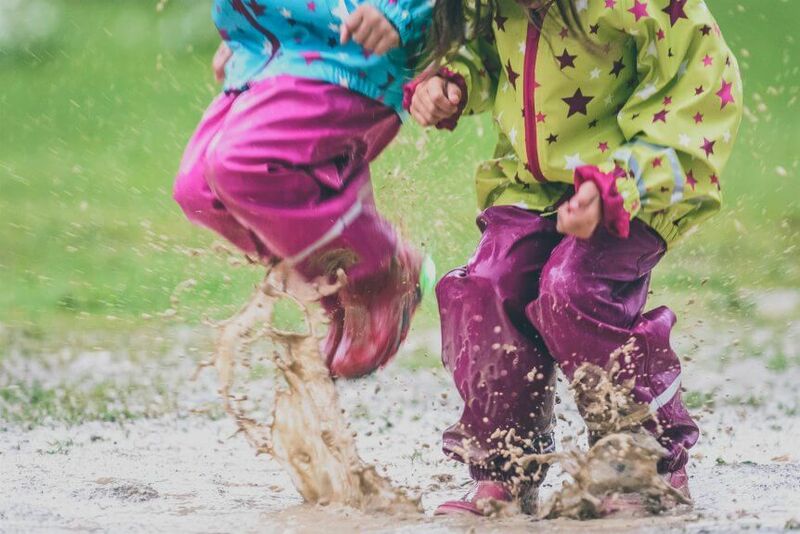 Forget about mess and mud and just let the kids have fun jumping in some puddles. If you’re feeling adventurous, you can could even join them. You can always head home for a bath afterwards. Make use of umbrellas and raincoats and have a game of hide and seek. If you’re at home, make use of any covered areas and dry spots. Just make sure you have clear boundaries of where you can and can’t hide so no one gets lost or stuck out in the rain for too long. So long as it’s not too cold, jumping on the trampoline in the rain can be loads of fun. Change into swimwear and set some rules about who is jumping when to stay safe. Obviously don’t try this one if there’s any lightning around though. Don’t let the rain stop you from going for a walk. If it’s safe to do so, get dressed in your wet weather gear and go exploring. You’ll be surprised at the different things you notice while it’s raining. There are a number of playgrounds around that are undercover and so still safe to play on during wet weather. While it’s not strictly outdoors, some shopping centres, fast food restaurants and a certain famous hardware chain also have indoor playgrounds you can make use of during rainy times. Don’t let a little rain dampen your outdoor fun. With a little clever thinking you can still play outside even though it’s raining. Use umbrellas and raincoats to keep you dry and then use your imagination to come up with some activities you can do.